NAIROBI, Kenya – Warning that Kenya is in “grave danger,” opposition leader Raila Odinga said in an interview with the Associated Press on Sunday that the country’s repeat presidential election was a sham and that a new vote should be held within 90 days. Low voter turnout in the election on Thursday, a repeat of an August election, indicated that the process wasn’t valid, and the government of President Uhuru Kenyatta is trying to “destroy other institutions of governance in our country,” including the Supreme Court, Odinga said. He boycotted the vote, saying electoral reform was needed. Odinga, 72, spoke after deadly clashes between police and opposition supporters broke out in some parts of Kenya since the repeat election, as well as the postponement of voting in several opposition strongholds where polling stations were unable to open because of security problems. At least eight people have been killed by police in the protests since the vote. “Our country is in grave danger,” said Odinga, adding that he is open to dialogue with the Kenyatta camp about holding what he calls a free and fair election. Odinga dismissed the repeat elections held last week saying that Kenyatta had no significant opposition. “It was basically Uhuru versus Uhuru,” Odinga said. With more than 90 percent of the votes counted the electoral commission says that Kenyatta has 7.1 million votes. Odinga cast doubt on those results, alleging that the electoral commission is boosting the number of votes for Kenyatta. He estimated that the votes for Kenyatta could be no more than 3.5 million of the country’s 19.6 million registered voters. Fears of intertribal clashes are rife as tensions rise in western Kenya after a Luo man was killed overnight Sunday in a clash between the Luo tribe, which supports Odinga, and the Kalenjin group, which supports Kenyatta. The Supreme Court nullified the Aug. 8 vote citing irregularities and illegalities and the electoral commission’s refusal to allow scrutiny of its computer servers to dispel Odinga’s assertion that hackers had infiltrated them and altered the vote in Kenyatta’s favor. Odinga said Kenyatta is trying to destroy Kenya’s institutions of governance and cited amendments ruling party legislators had pushed through parliament before the repeat election that reduced the powers of the Supreme Court to adjudicate election disputes and reduced the powers of the electoral commission chairman. The shooting of the driver of the Deputy Chief Justice Philomena Mwilu “frightened” justices just hours before the court determined whether the repeat election should be postponed, said Odinga. The Supreme Court failed to decide on the issue because only two judges showed up. Kenyatta had earlier called the Supreme Court judges “crooks” and promised to “fix” the judicial system after the Supreme Court nullified his re-election, and he warned the chief justice and judiciary not to interfere with the electoral commission as the country prepared for a new presidential vote. 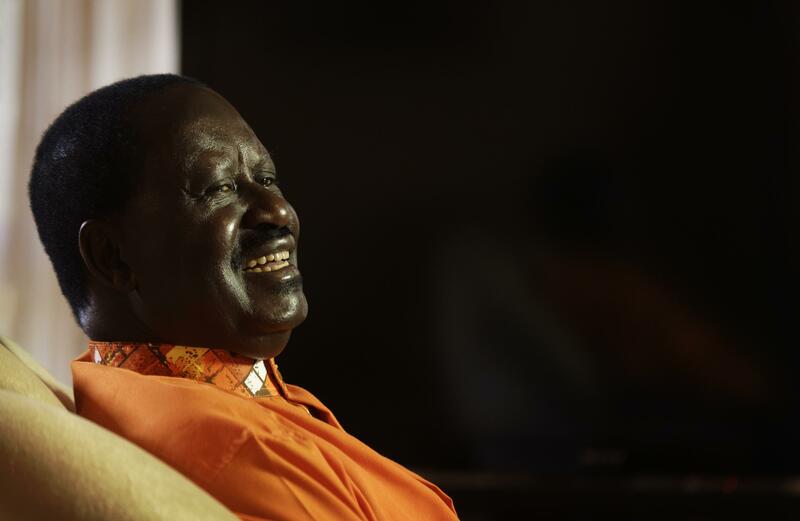 Odinga said his National Resistance Movement will take up an unarmed peaceful resistance by civilians to achieve its goals, likening it to the civil rights movement of the U.S. rights activist Martin Luther King and India’s Mahatma Gandhi. He said in order to achieve the goal of new elections in 90 days his movement will call strikes, peaceful demonstrations and boycotts. “All these are instruments available for the populace to put pressure on the government of the day,” he said. “Our constitution actually provides for this … if a regime is undemocratic, if a regime does not enjoy legitimacy, the people are justified to resist that regime,” he said. Published: Oct. 29, 2017, 10:41 a.m.